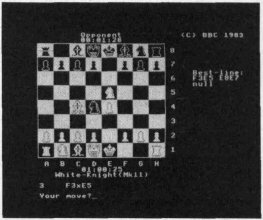 a series of computer chess programs by Martin Bryant written in the late 70s while he was student at the University of Manchester  . White Knight was written in the Pascal programming language to run on CDC Cyber 72. In 1981, White Knight mk 8 was ported to 6502 Assembly developed on an Apple II, in October 1982 bought by BBC for the BBC Micro  . Two versions of White Knight (mk 11 and 12) were released for this computer. White Knight played the European MCC 1981, already associated with Philidor Software  , the European MCC 1982 and European MCC 1983. In 1983, White Knight evolved to Bryant's mighty Colossus brand program, Colossus Chess  .